8b Black Brick Room Escape is another point & click escape game developed by 8bGames. Imagine that you fell asleep at night. When you woke up, you were in a new black brick room. 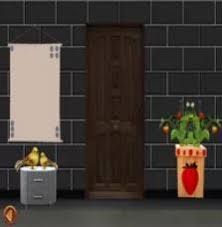 Find some hidden objects and clues and solve some interesting puzzles to escape from the black brick room. Good luck and have fun! Use the candle sticks for the green/red button puzzle. You will get the help you need. but even with this (for me) unlogical step, it d/give the result of sth after 50 (I think it was 53 or 54)...! For some reason the hearts puzzle is opposite to what is seems. Us the direction of the 'points' of the hearts. 'Smoke' from cups gives 4-digit hint.